An aerial view looking south of Hamilton Place mall and surrounding developments. 1. Hamilton Place mall 1987 / 1.2 million sq. ft.
2. Hamilton Crossing 1987 / 191,873 sq. ft.
3. Hamilton Corner 1990 / 67,150 sq. ft.
4. Hamilton Village 1990 / 413,700 sq. ft.
5. The Overlook 1993 / 214,918 sq. ft.
6. The Terrace 1997 / 155,836 sq. ft.
7. Gunbarrel Pointe 2000 / 273,913 sq. ft. This is an early photo of the Hamilton Place mall construction site from July 1986. * 1961 - Moses Lebovitz, Charles Lebovitz and Jay Solomon, principals of Independent Enterprises, start developing commercial and shopping center real estate. * 1970 - Independent Enterprises merges with Arlen Realty & Development Corp., a New York public company with a large portfolio of shopping centers primarily located in the eastern half of the United States. * 1977 - Charles Lebovitz becomes president of Arlen's shopping center division. * 1978 - Lebovitz and five associates form CBL & Associates Inc. to develop regional malls and community centers. Its first shopping mall, Plaza del Sol, in Del Rio, Texas, opened in March 1979. * 1993 - CBL becomes a real estate investment trust named CBL & Associates Properties Inc. and is listed on the New York Stock Exchange. * 2001 - CBL acquires 23 properties from The Jacobs Group -- the largest single acquisition in the company's history to date. * 2005 - CBL opens its first mall on the West Coast, Imperial Valley Mall in El Centro, Calif.
* 2011 - CBL and Horizon Group Properties open The Outlet Shoppes at Oklahoma City as the company begins developing outlet centers. * 2012 - The company marks the 25th year of its flagship Hamilton Place mall. It started with an out-of-the-blue phone call from an old college chum. Charles Lebovitz said his ex-classmate told him that his family had nearly 200 acres of wooded land off Interstate 75 in Chattanooga, and a company was interested in putting a shopping center there. "He said 'If anyone is going to build a shopping center on my family's property, it will be my old buddy,'" recalled Lebovitz, chairman of Chattanooga-based developer CBL & Associates Properties Inc.
That simple call set the wheels in motion for what eventually led to the building of Hamilton Place mall in 1987. "From that contact, I assembled this tract of land which is Hamilton Place today," said Lebovitz. Today, CBL's flagship mall marks 25 years since it opened its doors and drastically changed the shopping patterns of people in the region. The 1.2 million-square-foot mall continues as the area's retail powerhouse, drawing an estimated 2 million people annually to the center and nearby stores. Lebovitz, former longtime chief executive of the national shopping center company, said the phone call came in 1982 from former McCallie School and Vanderbilt University classmate Lou Conner, a Nashville lawyer. But the tract was owned by five members of the Conner family, and it took a year or two to gain their confidence to sell, Lebovitz said. "I was the Henry Kissinger of the Conner family," he joked. Another important key to the mall's development, he said, was securing access from the site to I-75. Lebovitz said that early talks with some major retailers indicated they weren't going to enter serious discussions about joining the mall project unless there was interstate access. "They said, 'It's a great piece of real estate ..., but if you get interstate access to I-75, come back and talk to us," he said. Gaining commitments from both state and federal transportation agencies for access helped move the project ahead, Lebovitz said. Still, CBL had to build most of the mall access roads. The Chattanooga firm spent $4 million to build interstate ramps and perimeter roads around the mall, according to news reports at the time. EMJ Corp., a Chattanooga-based construction company hired to lead the building of what was for many years Tennessee's largest mall, started site work in late 1985. Jim Sattler, EMJ's former chief executive, said construction of the mall itself took about a year, which was an ambitious schedule. "There were bets around town by other contractors that we would not make it [on time]," he said. Sattler said that building the mall helped EMJ a lot by showing other developers what the construction company could accomplish. "We were able to use that as leverage," he said. "That exhibited what we could do." EMJ went on to be one of the nation's top builders of commercial space, and it has its national headquarters in the same complex of buildings as CBL's home office next to the mall. Chattanooga Mayor Ron Littlefield, then the city's public works commissioner, said he remembers being at the mall's opening ceremony in August 1987 dressed in a new tuxedo. "I was wondering where it was all going to lead," he said. 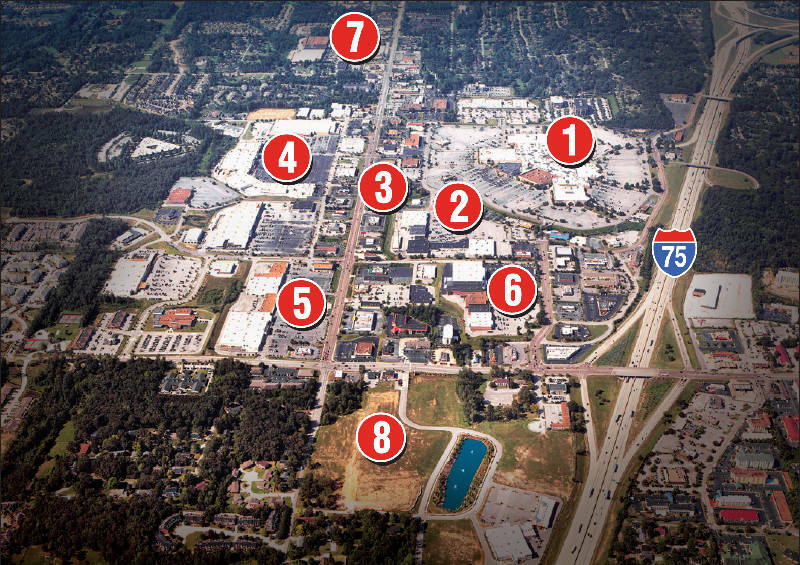 Where it led was to an array of new retail space, offices and homes in the East Brainerd area.Even today, it's among the fastest growing locations in Hamilton County. Littlefield recalled having arguments with traffic engineers over the widening of roads in the area, such as Gunbarrel Road. When the mall opened, Gunbarrel was two lanes except for a small section near the mall, he said. "[Traffic engineers] wanted to widen Gunbarrel to three lanes," Littlefield said. "I argued that wouldn't be enough." Gunbarrel was eventually widened to five lanes, though traffic still is often congested on the heavily traveled artery. For CBL, Hamilton Place was the third mall built in Chattanooga by CBL or affiliated companies. Lebovitz said his family's company opened Eastgate in 1962. Then, the center was only half its eventual size and wasn't enclosed, he said. "It was patterned after Lenox Square [in Atlanta]," Lebovitz said. Later, CBL teamed with the Osborne family and built the other half and enclosed it, the shopping center company official said. In 1972, the company built Northgate Mall in Hixson on land originally assembled for a drive-in movie theater. The company later sold the mall, but CBL last year reacquired it for $11.5 million in cash. CBL over the years has developed into one of the largest mall real estate investment trusts in the United States. It owns, holds interests in or manages 165 properties including 95 enclosed malls and open-air centers from coast to coast. Still, CBL executives consider Hamilton Place its flagship property. "Having Hamilton Place here is special," Lebovitz said. He said that neither Eastgate nor Northgate were envisioned to be true regional malls. "Neither had accessibility or visibility," the official said. "Hamilton Place offered those distinguishing features." Lebovitz said that with Chattanooga about 100 miles from Atlanta, Nashville, Knoxville, Huntsville and Birmingham, a super-regional mall ought to capture shoppers who live at least half-way to those cities. "It was an opportunity to bring something to the Chattanooga market that it did not offer pre-1987 ... and it stimulated growth that had already started in East Brainerd." At the time, not a lot of people believed Hamilton Place was really needed, Lebovitz said. "Existing retailers didn't understand what a regional mall could offer," he said. Lebovitz said Hamilton Place turned out better than expected, and "exponentially" so. Even 25 years after its opening, he said, sales at the mall on a per square foot basis are twice the average compared to CBL's overall portfolio. The CBL chairman said the company has continued to reinvest in the mall over the years and introduce new stores. "That's the dynamic nature of successful retailing -- to continually adjust as customers' likes and preferences change," he said. "We have to change. The stronger retail properties are not sitting on their laurels."